I’m hearing it again. It’s from outside. It’s somewhat a comforting sound. It’s a peaceful call amidst the city noise. For me, it signifies tranquility. I’m seating here from my desk finishing some online work and I can hear its sound signifying that it’s time for sleep. I bet it’s still a baby or perhaps a female one, because its croak sounded sharp and tiny, and not yet loudly full. It’s called in our local dialect as “tuko”, in Wikipedia it’s called “tokay gecko”. “Tuko” or “toko” is known as the second largest gecko in the world next to “Kawekaweau”- which was found in France. 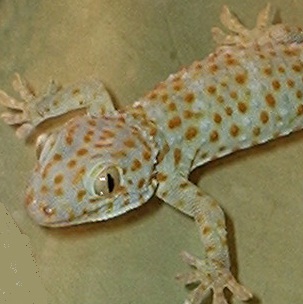 This gecko can grow up to 11 to 15 inches big. Every time I hear its voice, I also can’t stop thinking if the rumor about it being used to cure AIDS or cancer is true. Due to curiosity and as far as my searching has gone; I’ve found out that there is still no official scientific proof that these stories are accurate. There are also a lot of humored trading going on that a 500g and plus weight of this gecko costs 500 thousand to millions of pesos. Amazing! It sure is the fastest way to get rich. However, trading and transporting of these animals are considered a crime here in our country. I guess it’s a good thing because “tuko” is considered endangered now and these geckos can only be found in few Asian countries, including our Philippines. I still want to see a live gecko someday in my life. One thing too, when Gillian first heard the gecko calling, she was astonished by the sound of it. I even imitated the sound to her and she went “tkooo, kaaaw”. Cute little baby. I hope that “tuko” is here to stay, so Gillian can hear it until she’s old enough to know what that striking creature really is.